Today I am reminded that being brave for just a moment can change your life in a single day. 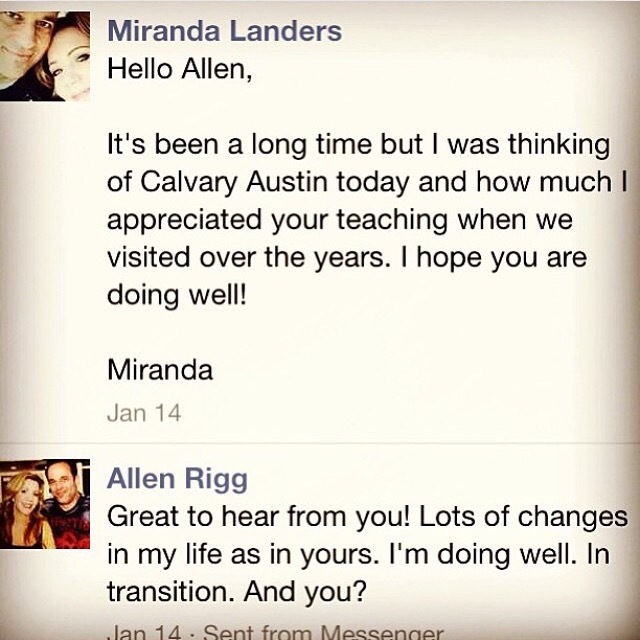 Three years ago on Jan. 13th I was sitting in front of my laptop sending emails to the Texas churches I had played at over the years, hoping to possibly move to the Austin area. I hadn’t reached out to any of them in at least 5 years and was fully expecting these pastors to hit the delete button or respond with hostility-not knowing what they had heard regarding Dez and I. One pastor in particular I could not find on the church website so I had to do a little extra digging in order to message him. I messaged a dozen others and after finding the lone pastor on facebook-for whatever reason-couldn’t bring myself to hit send. His was the church I wanted to attend. His teaching was far and away better than the multitudes I’d heard nationwide. He had always struck me as a trailblazer with an open mind and thoughtful responses, it would have been most upsetting to me if he were hostile. His message sat in my drafts all day and night. I almost didn’t send that message to Pastor Allen Rigg 🙂 What I was certain would be yet another setback, turned out to be a game changer. One moment of not being afraid to fail-changed the course of my life. I’m sooo glad I hit send! What have you been talking yourself out of? What risk are you afraid to take? How will you respond when someone reaches out to you?